Sri Lanka’s former President Mahinda Rajapaksa, center, waves at his supporters at the end of the five-day protest march from Kandy about 116 km to Colombo, in Sri Lanka, August 1, 2016. Sri Lanka’s former leader Mahinda Rajapaksa on Thursday criticised a government plan to grant 15,000 acres for Chinese investment in his constituency, saying it will deprive people of agricultural land. Rajapaksa, chided by the West and India for his close relations with China during his rule, is now agitating against President Maithripala Sirisena government’s moves to attract investment as he seeks to rally support under a new party. 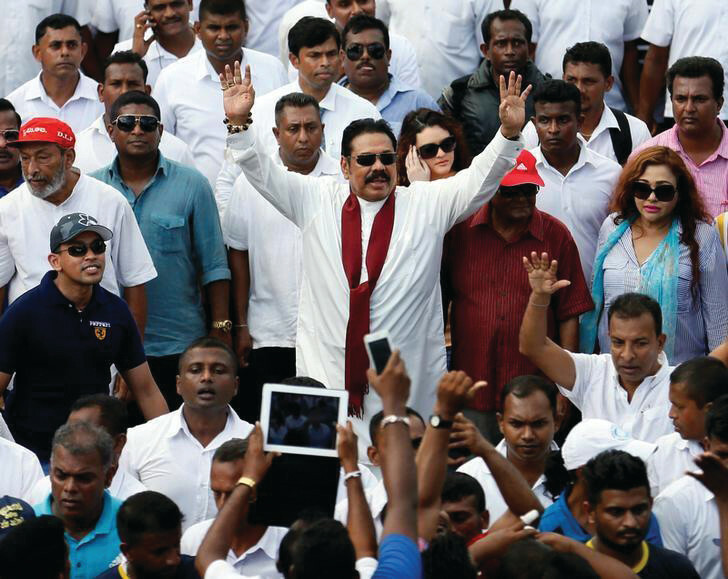 Despite his shock defeat in January 2015, Rajapaksa is still popular among Sinhala Buddhists, who accounts for 70 percent of the population, because of his leadership to end a 26-year war against Tamil Tiger separatists. He is backed by a newly formed party with around 45 legislators from the Sirisena-led Sri Lanka Freedom Party. However, while Sirisena’s coalition still has a two thirds majority in parliament and, under the constitution, the legislature cannot be dissolved until early 2020, local and provincial elections in 2017 could see Rajapaksa making gains. Sirisena government has agreed to give 15,000 acres of land to China in Rajapaksa’s constituency of Hambantota, where China Merchants Port Holdings Company will get 80 percent stake in a $1.5 billion port on a 99-year lease. The government says the investment zone will create thousands of jobs. “These are people’s agricultural lands. We are not against Chinese or Indians or Americans coming here for investment. But we are against the land being given to them and the privatisation they are doing,” Rajapaksa told the Foreign Correspondents’ Association at his official residence in Colombo. He said he had discussed his concerns with Chinese officials when he visited Beijing on a one-week visit last month. It is not clear whether his opposition and close ties to China could scupper the investment, creating further economic and diplomatic headaches for the government. China is Sri Lanka’s largest lender. But any groundswell of opposition to giving the land to the Chinese could cause problems, especially if the government ends up having to remove local residents and farmers by force. Some of the land is owned by the government. It is planning to pay compensation for the land it does not own. The deal is expected to be signed in early January. “We’re worried about it. We don’t mind about an industrial park coming in, but not like this. 15,000 acres is too much. We wanted to give 750 acres (under the last regime). When they (China) asked for 1,000 acres, I said no,” Rajapaska said. Rajapaksa, now a legislator in opposition benches, oversaw $7 billion Chinese financing into Sri Lanka’s infrastructure. Sirisena stopped most Chinese projects, including a $1.4 billion land reclamation project launched by Chinese President Xi Jinping, citing corruption and lack of proper procedures, resulting in a bitter diplomatic relationship with China. However, later Sirisena allowed the resumption of projects with China.